Enjoy hospitality, comfort, harmony and friendship during your favorite weeks in the year. You will find everything the heart desires, from culinary delights to breathtaking views of the Dolomites. 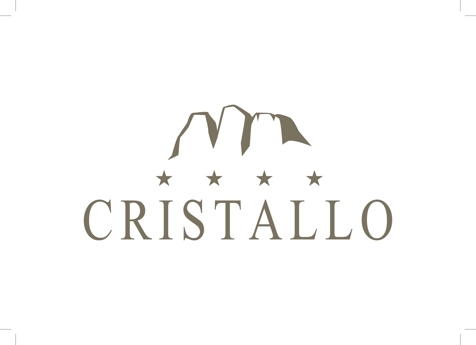 Welcome to Hotel Cristallo**** in Toblach! Hotel Cristallo**** in Toblach in Hochpustertal Valley is located in a fantastic position in the middle of the Dolomites. Hospitality, harmony and an original and warm atmosphere will make your holiday unforgettable. Our rooms and suite are furnished with all comfort: hair dryer, phone, radio, TV and mini bar. You will feel like at home. In our Chrystal Spa with sauna, indoor swimming pool and special treatments you will have moments of total relaxation. Our kitchen will spoil you with fresh and tasty dishes. 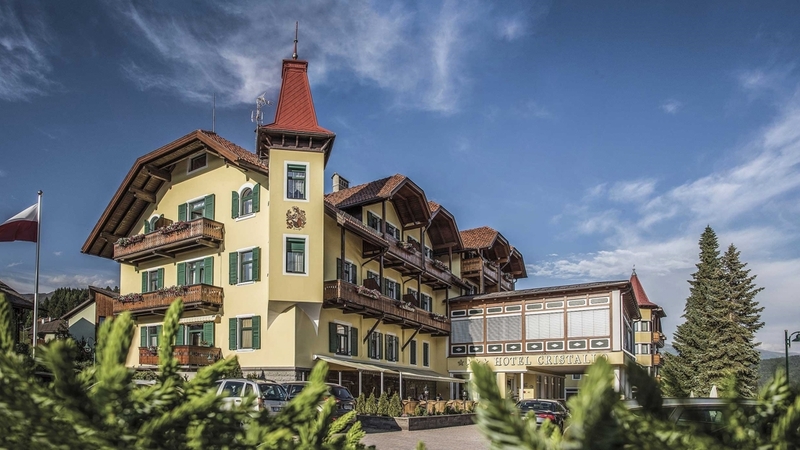 Hotel Cristallo**** is the best starting point for hiking, mountain bike tours, climbing, skiing or snow shoe hiking in the wonderful Dolomites in winter and summer. There is no chance for boredom! Suite with about 45 m², balcony and sitting room – lovely and smart furnished rooms with native compact wood and bathrooms in marble. Provided with: desk with a lamp, armchair, dressing gown, hair dryer, safe, backpack, color television with satellite channels and mini-bar. Juniorsuite with about 35 m², balcony and living corner – sunny and comfortable furnished rooms in compact wood. Provided with: desk with a lamp, armchair, dressing gown, hair dryer, safe, backpack, color television with satellite channels, WI-FI and mini-bar. Double room with about 25-30 m², south-facing balcony - sunny and comfortable furnished rooms in compact wood. Provided with: desk with a lamp, armchair, dressing gown, hair dryer, safe, backpack, color television with satellite channels, WI-FI and mini-bar. Double room with about 30 m² with balcony (east or west) – spacious and lovely furnished rooms in compact wood. Provided with: desk with a lamp, armchair, hair dryer, safe, phone, backpack, color television with satellite channels, WI-FI and mini-bar. Double room with about 20 m² - in compact wood. Provided with: desk with a lamp, armchair, hair dryer, safe, phone, backpack, color television with satellite channels, WI-FI and mini-bar. Single room with about 13 m² - in compact wood. Provided with: desk with a lamp, hair dryer, safe, phone, backpack, color television with satellite channels and WI-FI. Single room with about 15 m² with balcony (east) – spacious and lovely furnished room in compact wood. Provided with: desk with a lamp, armchair, hair dryer, safe, phone, backpack, color television with satellite channels, WI-FI and mini-bar. Single room "Cima Nove Superior"
Single room with about 15 m² with balcony (east) – spacious and lovely furnished room in compact wood. Provided with: desk with a lamp, armchair, hair dryer, safe, phone, backpack, color television with satellite channels and mini-bar. Familysuite with about 35 - 40m², partially with balcony and living corner or with separate room for children – sunny and comfortable furnished rooms in compact wood. Provided with: desk with a lamp, armchair, dressing gown, hair dryer, safe, phone, radio, color flat-television with satellite channels, WI-FI, bathrobe, backpack and mini-bar. The personal was very friendly and helpful. Food was excellent, especially the dinner in Sunday. Your good atmosphere with nice people and lovely dinners. Personnel extra ! Nice holidays . Breakfast and dinner were very good. We enjoyed being able to have some choices for dinner. Hotel is very well kept. We enjoyed using the lawn chairs. Hotel has a small feeling yet has many amenities of larger hotels. Nice bar. Nice library. Very nice hot tub and pool. Hotel is well located and most things are an easy walk. We appreciated the shuttle service to and from the train station. The servers in the dining room were really quite good and made us look forward to each meal. Ideally well located to visit Dolomiti areas by public transportation. Especially, we enjoyed the pool and spas after having walked in the countryside. We found nice that the hotel room was equipped with a very useful backpack suitable for trekking. For travellers who use public transportation, the hotel's service of picking up and dropping off at the railway station was very kind and highly appreciated. Very friendly and accommodating staff, great location! Pass a romatic getaway with your sweetheart at Hotel Cristallo.